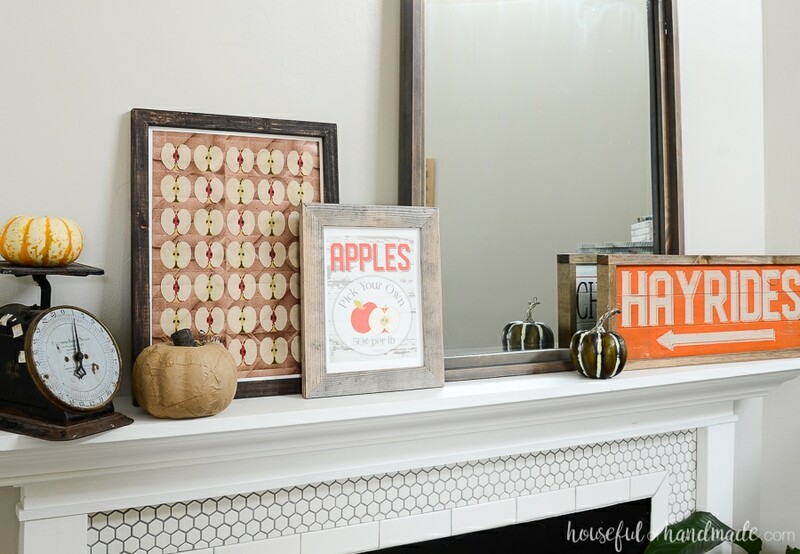 Decorate your mantel with beautiful signs and printables to highlight all the classic fall traditions you love. 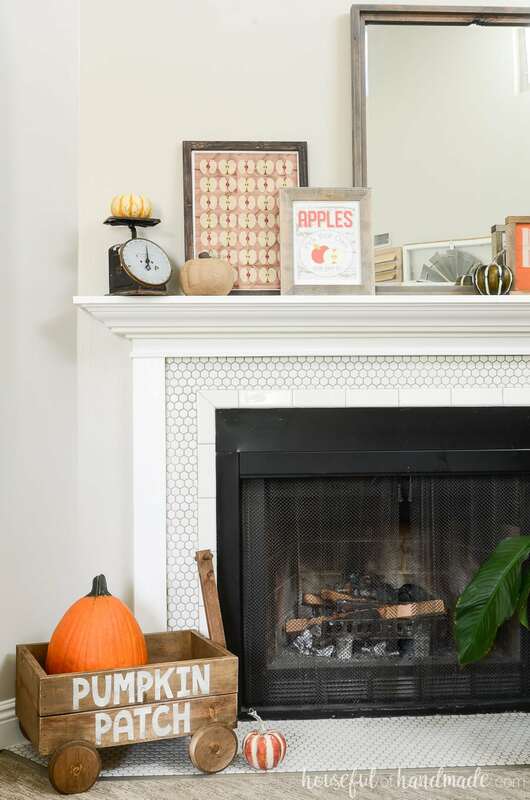 This fall mantel decor is timeless and fun! This year’s fall mantel decor is my farmhouse take on all my favorite classic kids traditions for fall. And if you are like me, and never grew out of enjoying all the fun things fall has! I am so excited to share our beautiful fall mantel with you, and I teamed up with 10 other bloggers to share their fall mantels too. So make sure to check out all the inspirational fall decor below! Sometimes I just love to add a little fun and whimsy to our home decor. Our home, while I love the sleek beauty of it, is also a family home. I want our kids to be excited about the decor too. So this year I kept things classic with touches of red & orange, and then added all our favorite things about fall. 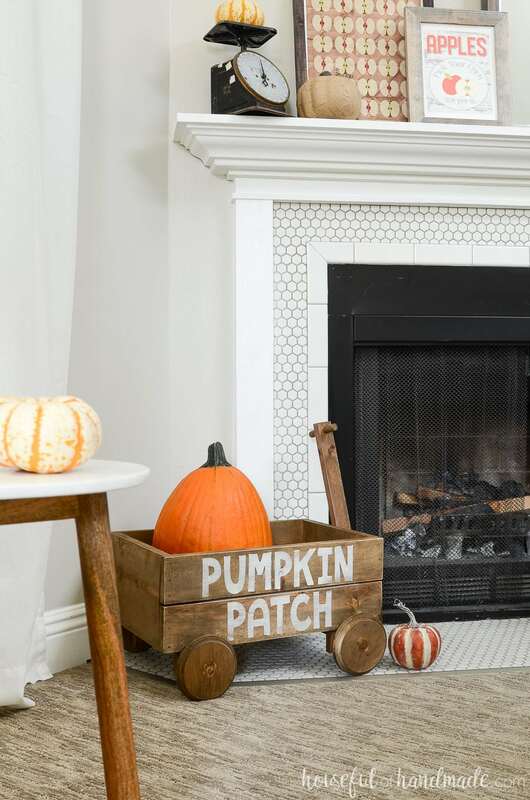 Our fall traditions mantel decor includes going to pumpkin patch, hayrides and apple picking! We are not leaving anything out (except maybe jumping in the leaves, but we had to stop somewhere). And the bright colors and pumpkin patch wagon make the kids happy. They keep asking me every day when we are going to the pumpkin patch now! 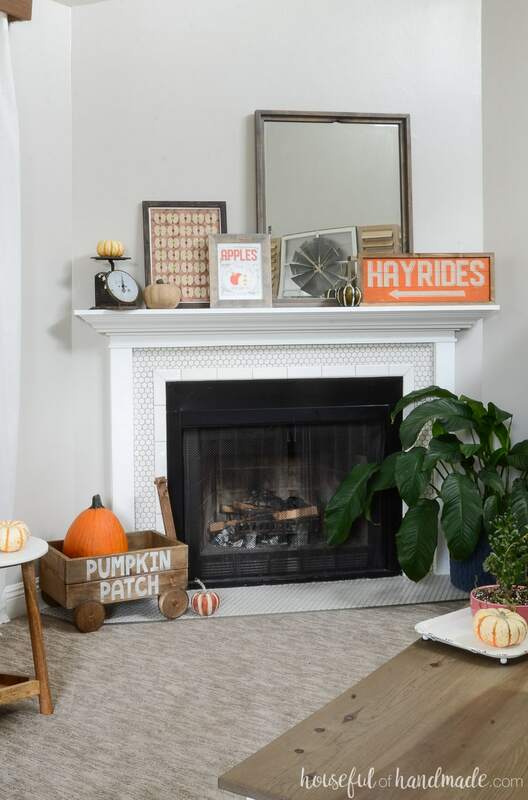 To keep our fall mantel decor from getting to juvenile, I did make the signs and printables with my favorite farmhouse flair. Reclaimed or chippy wood and simple farm style signs make me happy! It’s the best of both worlds. I always start our mantel off with my DIY Rustic Mirror. Having a large mirror in any room helps add light because it bounces the light back into the space. This mirror was made from scraps left over from making our new rustic railings. It’s home is always the mantel and I like to turn it portrait or landscape to work with the decor. This time I went tall with the mirror to balance out the short & wide signs. Last week I shared this fun Apple picking fall printable. The bright red and chippy wood background are perfect for a fall mantel. To frame the sign, I used some reclaimed wood that my father-in-law gave me from a friends old garden fence. The grayish tones of weathered pine are the perfect accent for the sign. If you are not lucky enough to have a pile of old wood in your garage, you can get a similar look with a weathered wood accelerator. I built my frames using my how to build a rustic picture frame in 20 minutes tutorial. The other apple print is one I made a while ago and have held onto since I love it so. I decided to add it to my subscriber library since it matches the new Apple picking fall printable and the other printable Fall Apple sign too. Click here to subscribe to my newsletter and gain access to all the freebies. For the Hayrides wood sign, I made the sign with my new DIY Kit. This sign is actually double-sided (you might be able to see a sneak peak of the Christmas tree farm sign on the back in the reflection of the mirror). You can easily make your own Double-Sided wood sign with these incredible DIY Kits. Everything is precut and ready for you to start creating! As much as I loved the way my classic traditions fall mantel was coming along, I knew it needed to include the most iconic fall tradition ever: visiting the Pumpkin Patch! There is just something special about walking up and down the isles of pumpkins, looking hard for the best one ever. All while cuddled up in scarves and boots and sipping hot apple cider. I cant wait! 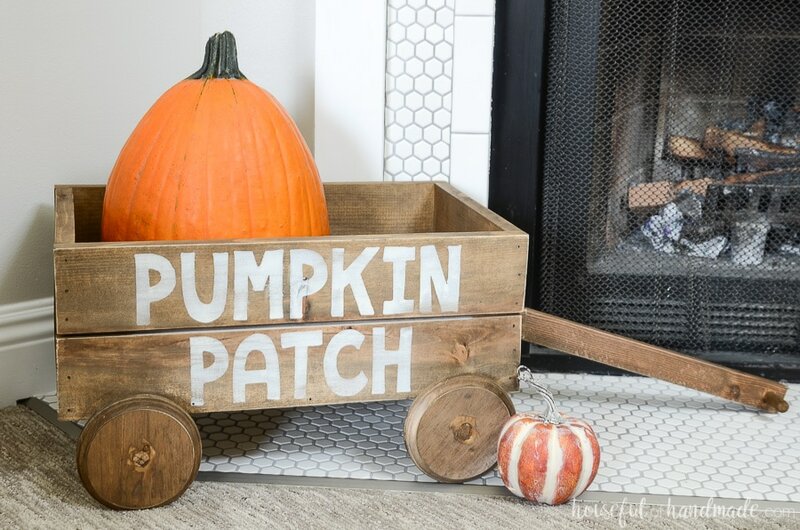 Instead of another sign, I decided to make a little wood pumpkin patch wagon for our mantel. Oh my gosh! I am so glad I did. Isn’t it just the best thing ever? The little wood wagon even really rolls. I probably wouldn’t recommend putting someone in it because the wheels are only held up with a wood dowel. The strength may not be there! But it is adorable for decorations or even for a small child to pull their dollies. I will have the build plans for our decorative wood wagon on the blog on Thursday if you want to make your own. And really, who wouldn’t want one? It would also be so cute for fall porch decor, but sadly I do not have a porch so I have to skip that fun place to decorate. To finish off our mantel I added lots of pumpkins! Or course pumpkins are the best things about fall. Whether it’s in your coffee, pie or decor! Am I right? We added a large real pumpkin to the wagon. But on the mantel I used some decorative pumpkins too. 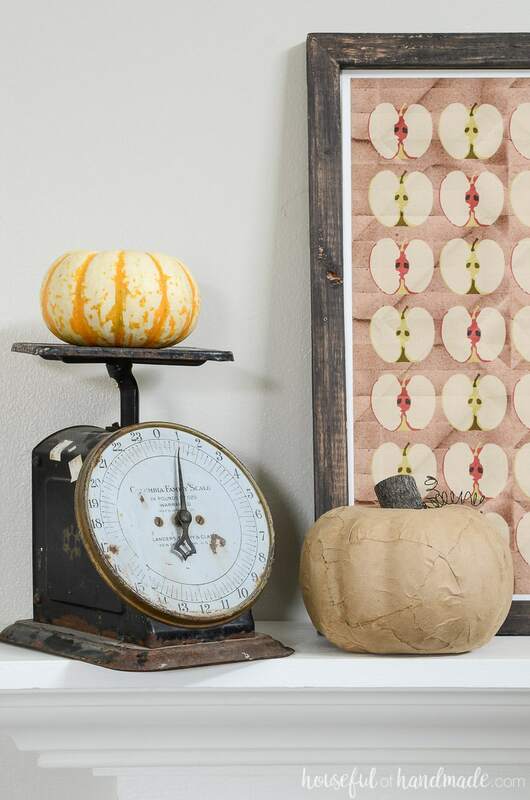 The brown pumpkin is one of my favorite dollar store crafts. These Easy Rustic Pumpkins from Dollar Store Pumpkins are so easy to make but look so good. And now our house is looking so much like fall. I don’t know if it’s because I finally decorated or what, but I think fall might even show up soon. It was so cool this morning, I had to pull my slippers out of their summer hiding spot. I am so excited for fall! For even more fall decor ideas, make sure to check out how all my blogging friends decorated their mantels too. So many beautiful ideas. Just grab you favorite PSL and curl up and enjoy! 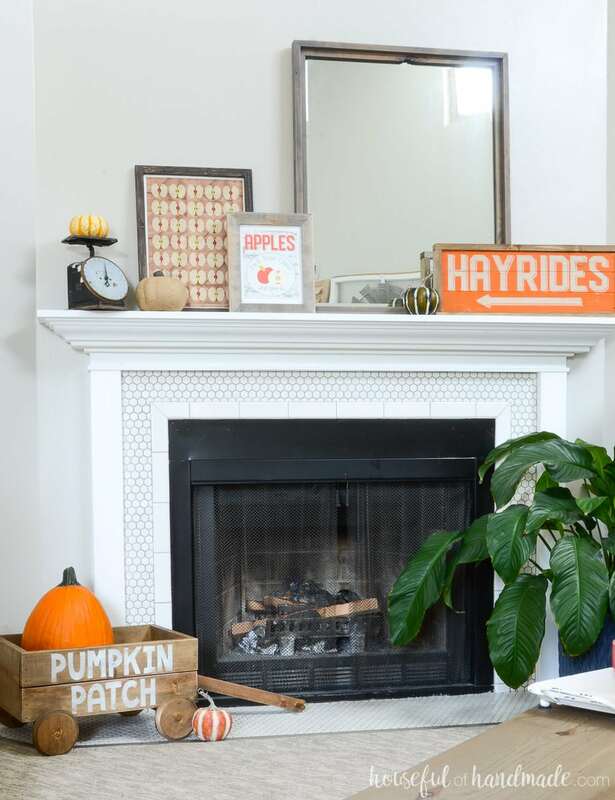 I love all of your DIY signs and your mantel is so full of fall fun! But that wagon is my fave!! It’s so adorable and looks perfect with that pumpkin! Thanks Melissa! I am loving the wagon so much too! I’ll grab mat jacket and meet you on that hayride 😉 The plans are up for the wagon now, it was so quick to make in an afternoon too! Your mantle turned out so cute! 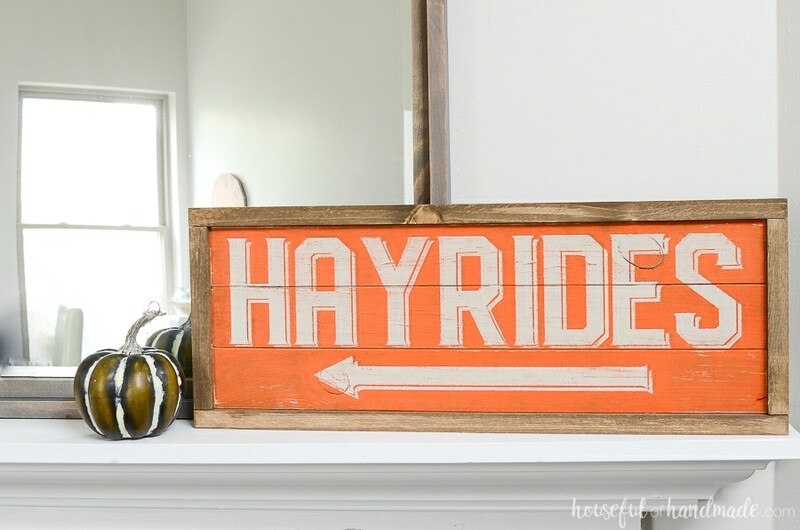 I love all the whimsical decor… hayrides?! Yes, please! I love your color use and signage! And that wagon is just perfect! I need one of those! I just love the idea that you integrated your traditions into your home! So fun! And I really love the pop of orange. So many fun DIY touches! Your mantel has me all excited for fun fall traditions – if only it would stop raining where I am! 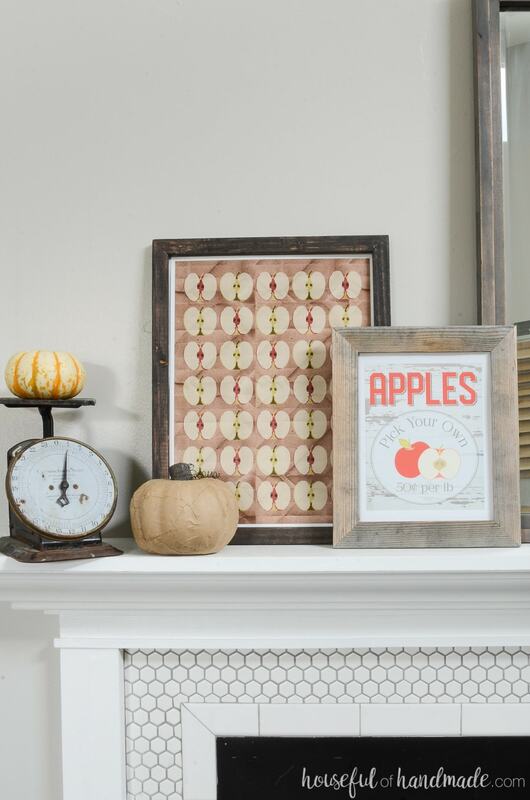 I think the apple slice print is my favorite and I also love that you are selling DIY project kits. What a fun way to make it easy for others to make your projects. Thanks Carrie! It’s been raining so much here too. I’m ready for some fall fun. Your fall mantel is so festive and happy. You are welcoming the season right! Thank you for sharing it!